I mean honest 5 shot 100 yd groups. I get 1.5-2 MoA, everytime a Saiga 308 owner posts sub 2 MoA groups though, people never seem capable of believing it. What says you guys? I've never gotten better than a 1.5 inch 5 shot group and 1.75-2.3 inches is typical and considering I can barely produce a 3 inch group standing off hand it shoots better than I can for the purpose I bought it to serve. Everybody that has been out shooting with me has been amazed at the accuracy of the thing. Had a friend with a new Marlin lever gun and we both shot better off hand with the .308 Saiga. I think it kind of pissed him off, but now he wants me to help him build one for himself. I think mine is easily capable of sub 2 inch groups like it sits and probably could do better with just a little work. For what I wanted the rifle for, it is plenty accurate enough. I have been pleasantly surprised by it. One side benefit of this rifle is that every time I shoot it, I get a silly grin on my face. Happens every time! 3-4 but its probably the ammo I'm using. I can't afford to buy the good stuff (I'm a poor boy ). 3-4 MOA is more than enough for my uses. I also get 3-4 @ 100 yards on average, 2-3 sometimes but its good enough for me. My S-.308 is highly modified including a free floating handguard and fluted barrel, but will do (with scope) about a 1 minute group. 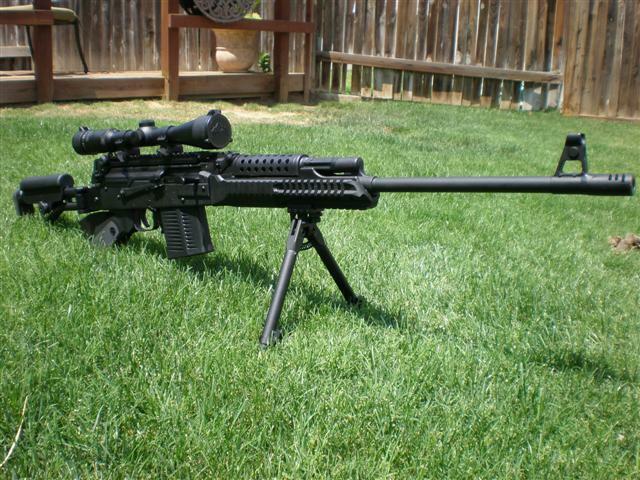 I must say Tritium,you have the coolest Saiga 308 I have ever seen. Did you shoot it before free floating?If so where all of the other mods already done before then?Did the free floating really reduce the "flyers". My Saiga with a conventional RPK forend starts to really turn in an amazing group and then ZIP I get a flyer that opens up my group about an inch by round 4-6.Is that the original Saiga barrel modified or did you rebarrel? I hate to hijack this thread but I can't help but think that the Saiga has all of the ingredients to be a 1 MOA gun if properly tuned because the bolt to breech fit is mega-square,the chamber end of the barrel is thicker and the additional lug evens out the breech face pressure significantly(when firing 2 lug bolts rock and let the case shift during bullet/case separation right as the bullet takes it seat in the rifling). I can out-shoot my buddies AR, is that satisfactory? I won't claim anything for myself but he smokes a pack a day and drinks energy drinks like water then wonders why he can't hold on target. It's still a fun claim to fame.... we'll just leave the background info out. I haven't been able to get mine anywhere near the target because the rail is canted upward on the receiver. I've had two 308s and both of them were like this. Can't believe I'm the only one. Anyone know a good permanent fix? As to accuracy IMHO none of these claims mean very much without stating what kind of ammo you were using and how many kinds you've tried. If you shoot Wolf that's one thing, surplus another, hunting ammo another, match another, reloads another, etc. etc. Even if you've shot high dollar match ammo if you've only tried one brand or bullet weight you could completely be missing your rifle's sweet spot. I have a hunch these rifles could display a lot better accuracy if one would just take the time to dial them in like they would a fine bench rest rifle. Of course its not going to compete in that area but when someone here says he gets 1.5-2 moa and some guy who spends all day dialing in his AR says he gets .5 moa I don't think we're comparing apples to apples. Here's a previous thread with lots of info: http://forum.saiga-12.com/index.php?showto...mp;#entry255544 Still questions? Just ask. My long barrel Saiganov build is now a 1MOA gun, but I had to make it that way. * I recrowned the barrel and that helped a little. * I ditched the side mount and went with the Krebs beryl style rail system, and that helped a little with accuracy and a lot in returning to zero. * I finally perfected the Burris ballistic plex system for near perfect zero at each distance. * And most importantly - find the right load for your gun! I get great 1" groups at 100 yrds with 168gr match loads, but those are not grouping well past 300 yards. My rifle really likes the German DAG ammo, and does 9-10" 5-shot groups at 500 yards (which is great for a lightweight low-power scope). Problem is, I cant find the German stuff anymore and I am down to about 300 rounds. Just be mindful that I could have bought 3 savage 308 rifles for what I put into this gun and the Savages will probably still out shoot it. DD, what type of brake is on your .308? It is a simple homemade brake. I did some reseach on designs that might improve accuracy a little, and settled on this design because it seems to be very effective and it is very simple to make. Nothing fancy. Here is a link that helped me along in making mine. First 3 shots on cold bbl its typically 1 moa or less. Heat it up and 3 moa is typical. Not too bad for the money involved. YMMV. So when is somebody gonna install a bull barrel? I know "polishing a turd...." bla bla bla. I just want to see what a 1" Shillen select match barrel and action lock would make happen. The dynamics of the AK action may be less than ideal but I know a good barrel would get us something. I just want to see it done, just so we know. I bet you would see from impressive numbers. the Saiga may be loose as a goose when the breech is open but it locks up pretty tight, especially with precision head spacing and a little bit of truing. Tired of getting crapped on by AR people about accuracy when they have all of the options in the world when it comes to barrels and we're stuck with com bloc. For the time and money involved you'd be better of with a 308 AR platform. Not pimping AR's, but for what you're looking for why not start with a better platform..? As far as that goes you might as well start with a bolt gun. I just want to see it done. Just so we know. If I had the resources I would do it just because it's never been done. What is the true capabilities of a Saiga? matter of fact is we don't know. Probably, you'd wind up with a gun just a little more or less accurate than a 308 VEPR. I didn't realize the Vepr's were of such high build quality. I realize they're the "Cadillacs" of AK's but are their manufacturing process on the level of Stag AR's (or other custom shops for that matter)? Aren't they still military mules? If accuracy is the #1 requirement, just get a bolt gun and be done with it. For many people it's simply fun to tinker with guns and see how good they can perform. Plus there are advantages to semiautomatic actions. Then there's the style or cool factor, if the AR-10 doesn't appeal to a person, what other options are there in a military-type semiauto? M-14, FAL, CETME, ... or the Saiga. Take your pick, they're all guns worth owning. As for "turd polishing".... I never realized it until I got my C&R license just how good Finnish Mosin Nagants can be. I've had various Russian Mosins and they're all rough as hell. Then I got my first Finn, a 1942 M-39 with a barrel in Belgium by FN, with hand fitted parts from various previous models all fitted together in a beautiful flame figured arctic birch stock. The darn thing shoots sub MOA. Not bad for a polished turd. Reading all these and knowing that I've yet to see a 7.62x39 AK of any variety do better than 2" groups at 100, makes me very anxious to buy a .308 and see what I can do. Although I think I'd rather have Desert Dog write a book on how he did his first. I guess my real question would be, is that is there any reasonable way to reduce the effect of the gas tube on the barrel? I have poked around and not found a lot of info. I would think that free floating the hand guard and reducing the effects of the gas tube might really help. I'm not trying to advertise for anyone but you might try www.copesdistributing.net for some German ammo, they have a few different types.